When selecting jewelry like rings and bracelets, it is important to keep durability and sturdiness in mind. 10Kt, 14Kt or 18Kt gold might be a better choice for such items as they are more frequently worn. Another factor that should be considered is that 10Kt is more difficult to bend and is a little springier. Therefore a fine 10Kt ring is less likely to bend out of shape than a fine 18Kt ring. 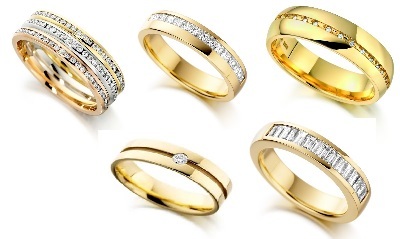 22Kt and 24Kt gold is generally considered too soft to be used to make men’s wedding rings. If you are interested, you can read this for a more comprehensive breakdown of the properties of gold purity. There are other forms of gold that can be considered when shopping for jewelry. Gold Vermeil Jewelry uses gold plated sterling silver. The premier quality gold vermeil is 24Kt. Gold-Filled Jewelry is gold bonded to a base alloy such as brass or nickel. Generally, gold should amount for 5% of total weight and all exterior parts are solid gold. Gold Plated Jewelry uses a base metal, steel or brass, which is electroplated with gold. White Gold Jewelry combines pure gold with other white metals, like silver, zinc, nickel and platinum. White gold jewelry is brittle, durable and resistant to tarnish, and requires platinum or rhodium plating. Rose Gold is an alloy that unites gold with copper to produce a golden metal with a reddish hue. Based on the amount of copper, the intensity of rose gold will be darker or lighter. Copyright © 2015 Artisan Gemstone Jewelry Site. All Rights Reserved.